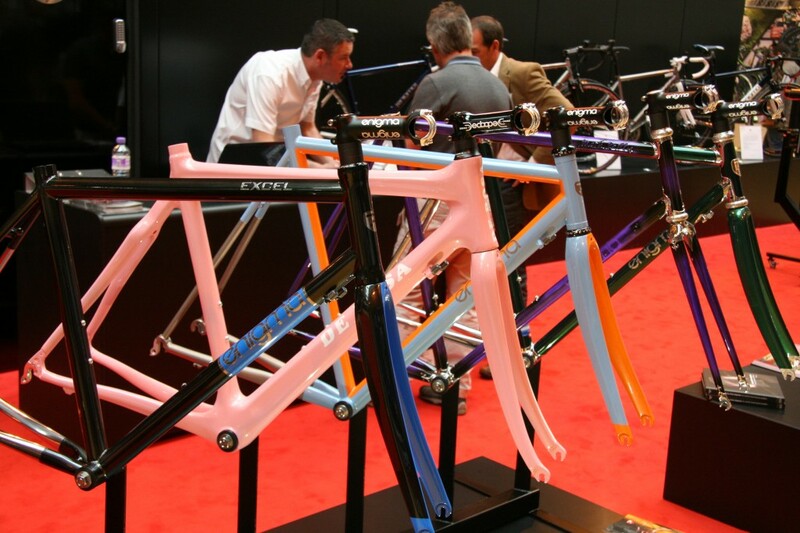 *Plenty of manufacturers turning out high end steel race frames. Not because it’s niche but because it’s a fine material for the job. 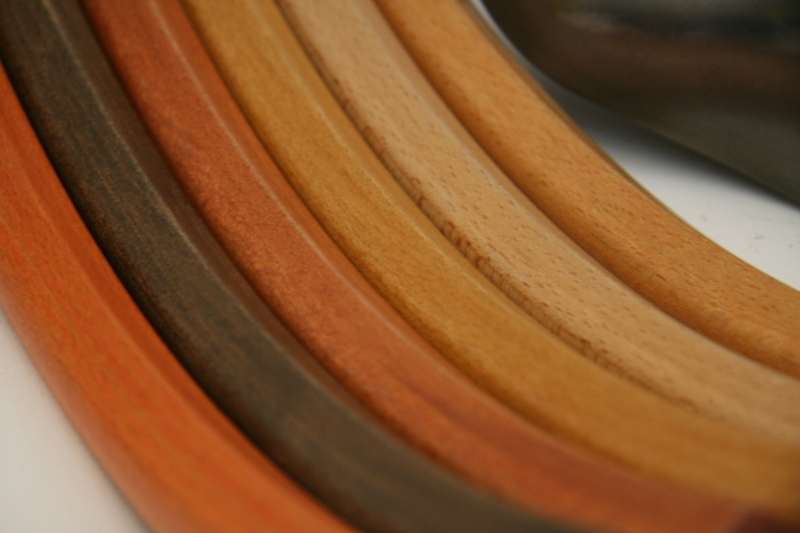 *Depth and breadth of stands, everything from the big corporate displays from the usual suspects down to much smaller companies with some interesting products. 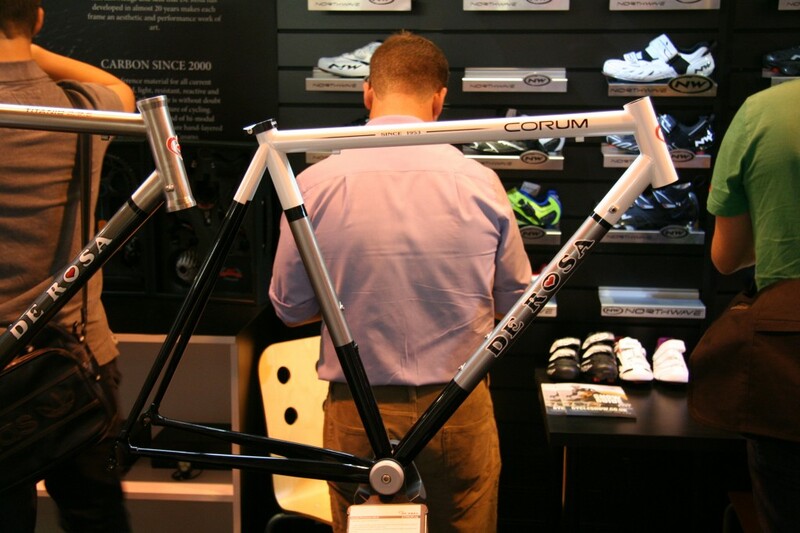 *The proliferation of utility bikes, commuting bikes and e-bikes. Are we on the verge of a paradigm shift here in the UK? *The real high end stuff. The game keeps moving on, some of the £10k+ Pinarellos and their ilk with electronic gearing were things of functional beauty. 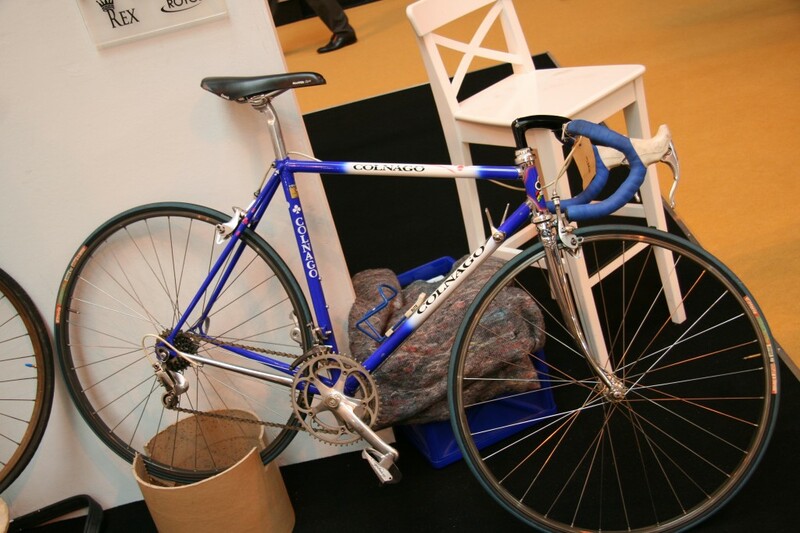 The Condor Super Acciaio was the highlight of the London based shop and manufacturer’s stand (Costa coffee sticker excepted), really nice steel frame. 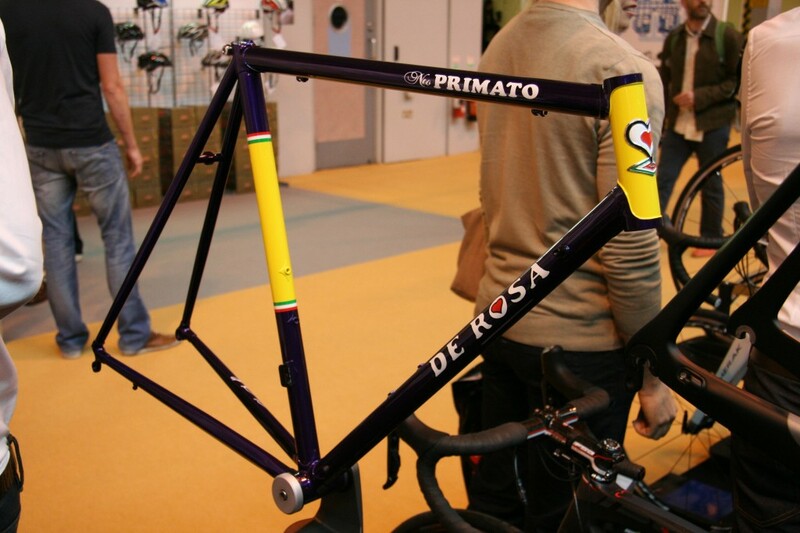 If retrobike ever happened to be in the market for a frame made this decade this would make the list. 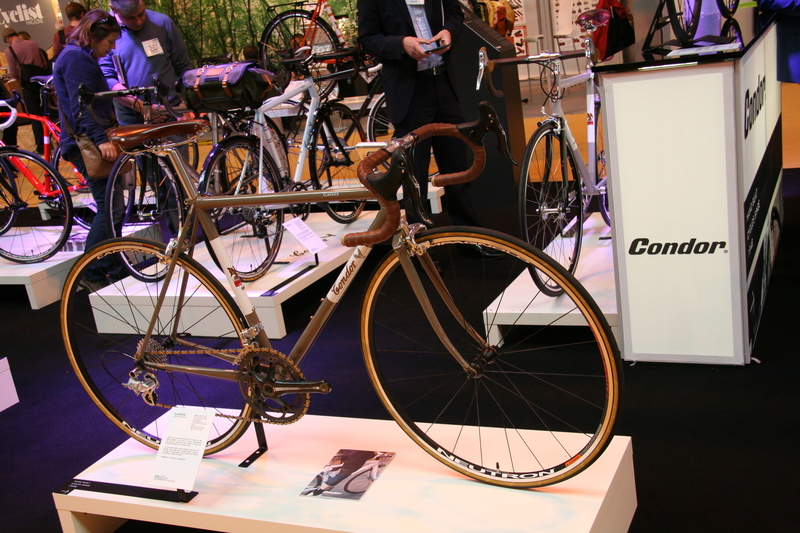 Condor also had a number of other fine looking steel bikes including the Classica and Paris pictured below. 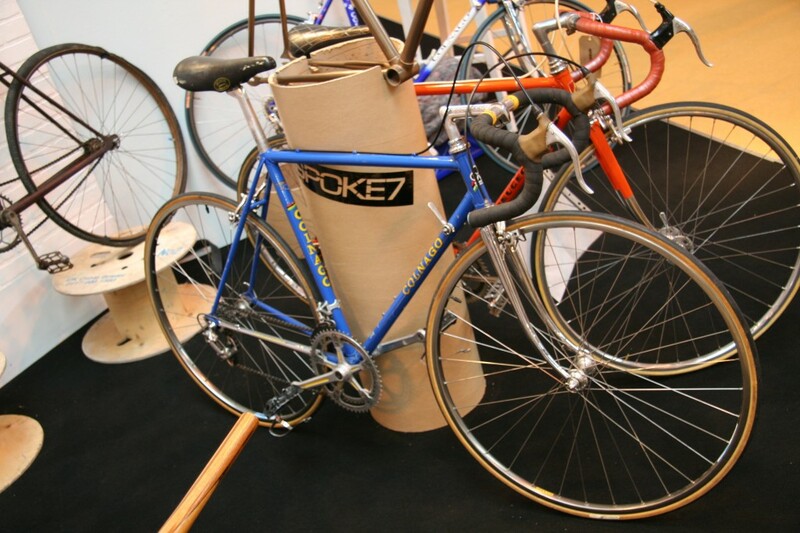 Spoke7 are a new retailer who also import ghisallo wooden cycling parts along with vintage used bikes from Italy. 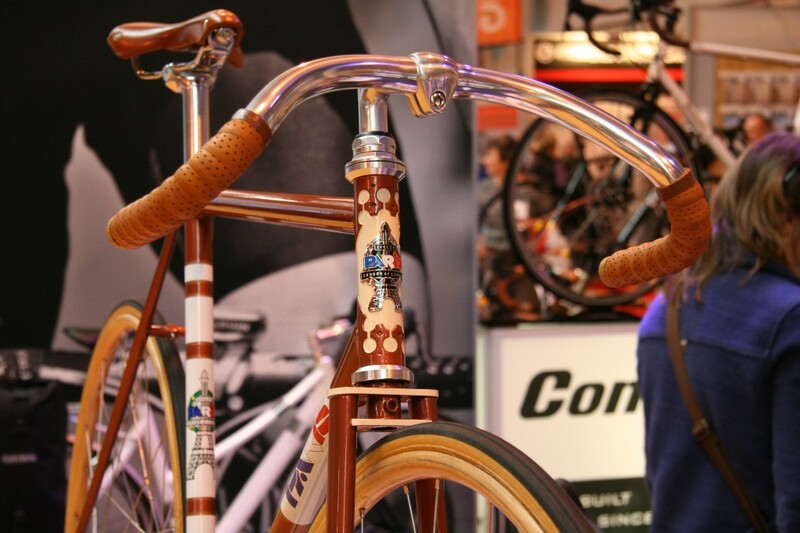 The ghisallo wooden rims and guards were super niche and beautifully made, howerer we expect Spoke7 might have more luck somewhere like Bespoked Bristol with their wares. 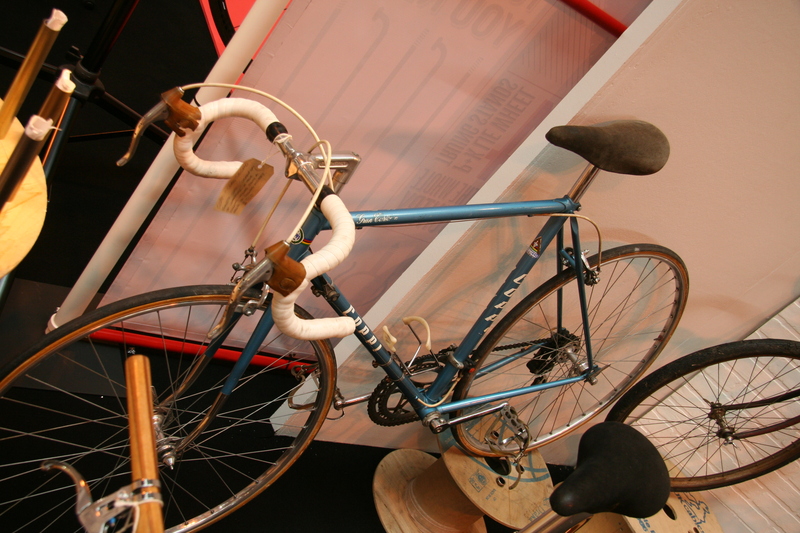 Spoke7 also had a number of vintage road bike on display, all apparently imported from Italy. 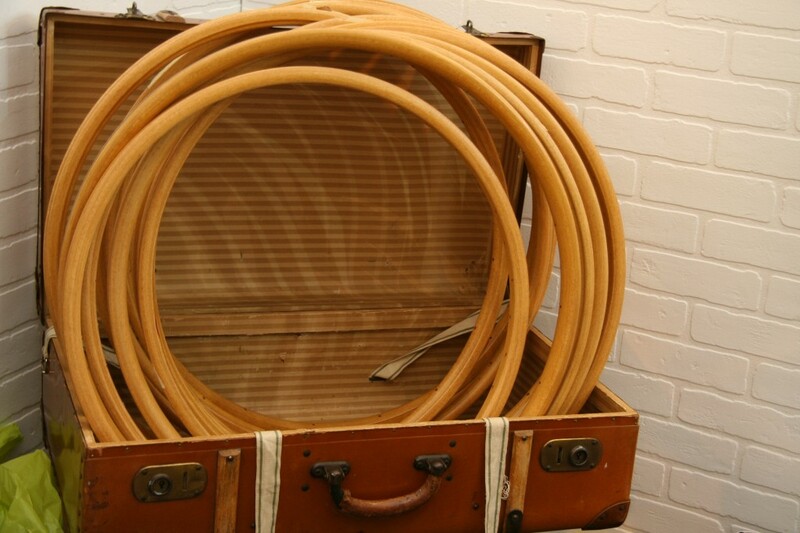 Some nice stuff on offer but with prices to match. 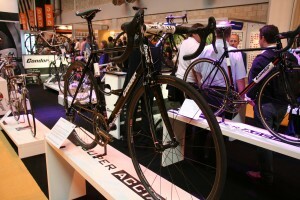 Good to see Raleigh with such a big stand at this years show. Majority of the stand was taken up with their modern offering including some rather fine looking carbon road bikes. One item was of particular interest to the vintage fan, the Ti-Raleigh reissue. 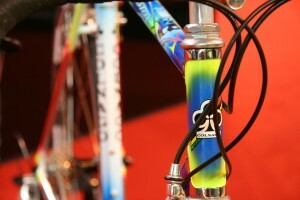 Nice enough job but as discussed elsewhere on retrobike perhaps an opportunity missed. 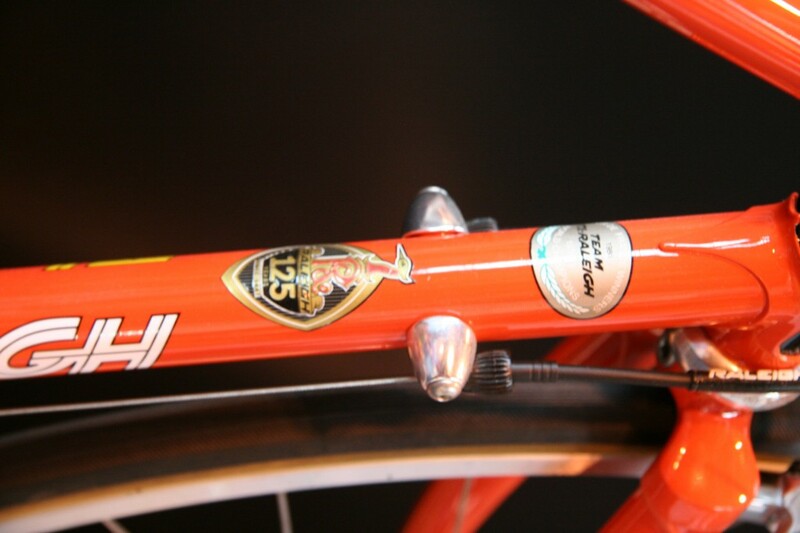 Something genuinely high end in perhaps 953 steel with a top line gruppo on would’ve been much more welcome in our eyes. 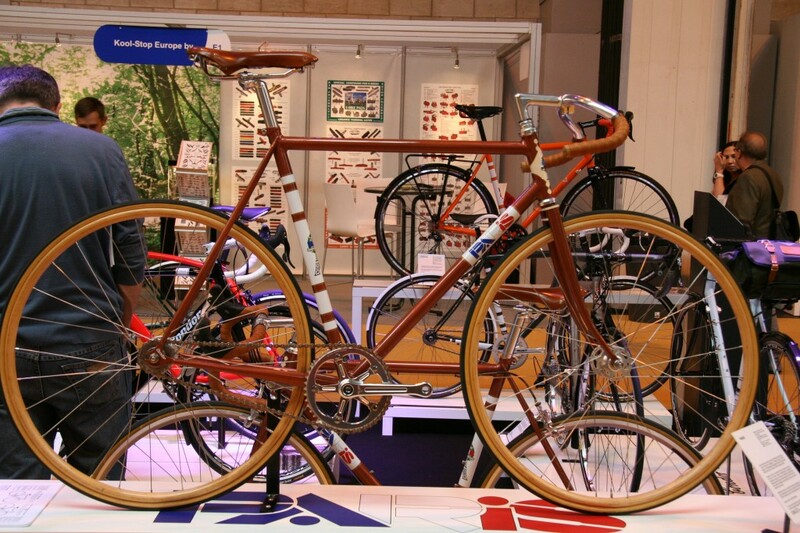 This British based steel and titanium builder had a fine array of bikes and frames on show, we especially liked the model pictured in Gulf livery. modern CORUM framset which is TIGGED from 18MCDV6 steel (whatever that is exactly!). 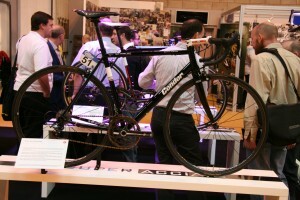 Other honourable mentions to Colnago with a new Master and clean looking track bike. 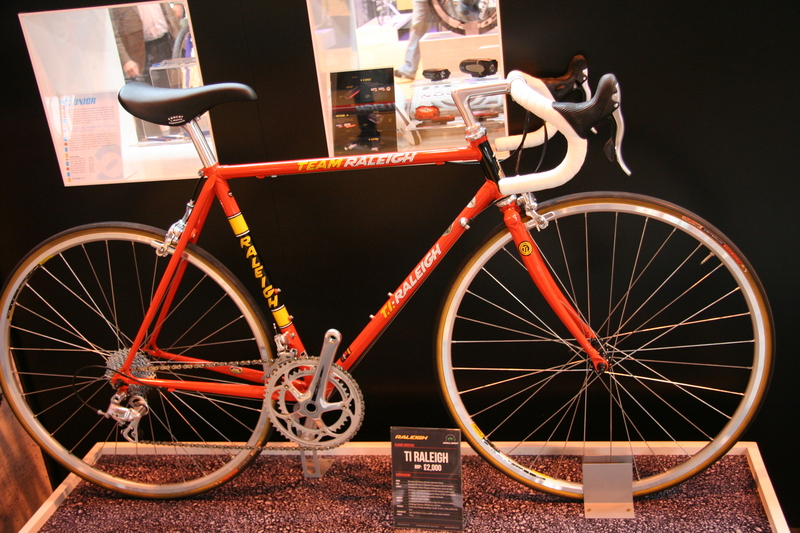 Chicken had a couple of nice steel cinellis and the Bianchi stand had the ‘Pantani’ bike which has been touring round shows for a few years. 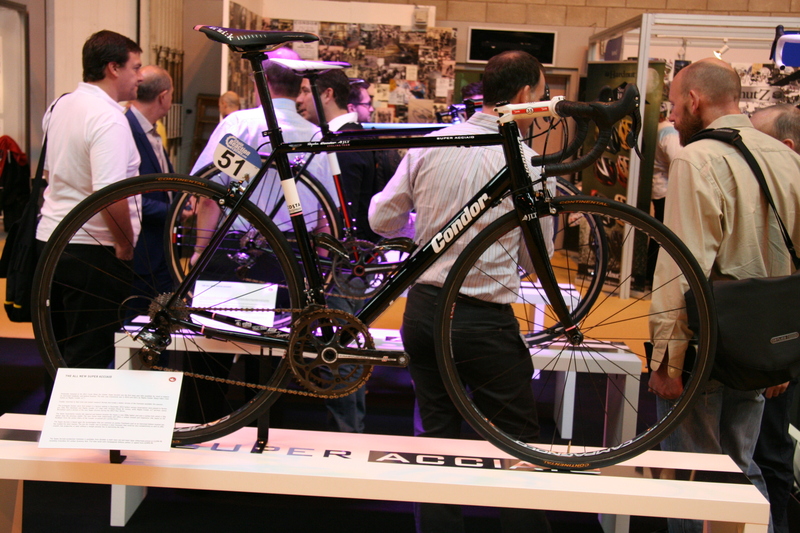 Click here to discuss the NEC cycleshow 2013 in the forum.